Japanese dining in Bangkok has gone mainstream in recent years, with a great choice of dining styles now available, and this month we decided to look at some of the popular options. Gaggan Anand, who can always be relied upon for the unexpected, last year opened an omakase restaurant in cooperation with Japan’s Takeshi Fukuyama, the big difference being that this venture specialises in tofu. Mihara Tofuten is the world’s first tofu omakase restaurant, and a fascinating concept it is too. Another bold idea is the new Tenshino, at the Pullman King Power hotel, an extraordinary restaurant whose bohemian decor places it somewhere on the Parisian Left Bank, and whose food has cheerfully embraced French ingredients. There is always room in this town for a pan-Japanese menu of good quality, and Kisso has for more than twenty years excelled in catering for international and Thai diners, in addition of course to Japanese guests. Recently refurbished, the restaurant now enters its third decade in fine style. And then there is Benihana. The original Benihana has been feeding and entertaining guests at the Anantara Riverside on Thonburi-side for more years than we care to remember, but the recent rebranding of the Amari Atrium to an Avani (same group as Anantara) brings Benihana to the Bangkok side of the river. We went to take a look. Have fun exploring these and other Japanese restaurants in Bangkok. Japanese steakhouse famed for its juggling chefs and teppanyaki cuisine, now with its second Bangkok branch at the Avani Atrium. Long-established restaurant in the Westin Grande, offering a full-spectrum Japanese dining experience. 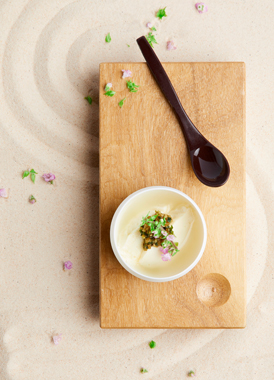 Gaggan Anand opened this tofu omakase restaurant last March in venture with respected chef Takeshi Fukuyama, the tofu being made on the premises using purely Japanese ingredients. Bohemian-style Japanese restaurant with French influences, located in the Pullman King Power hotel.